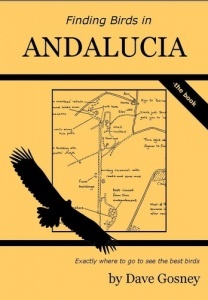 If you want to see the best birds of Andalucia, including species such as Red-knobbed Coot, Little Swift, Spanish Imperial Eagle, Marbled Duck, Black-shouldered Kite, Black-rumped Waxbill and Great Bustard, then this is the book for you. When I was planning my recent visit to Spain I found myself bewildered by the sheer volume of information available. There are some very good books covering the area including four published in the last three years. Then there are loads of trip reports on the internet - I actually sifted through over 450 pages of online text, for Andalucia alone. Sometimes it was a struggle to make sense of it all ‘where do they mean? how do you get there? is that the same site under a different name?’ And when I got to Andalucia I found some sites that weren’t described in the books, some that turned out to be better or worse than I’d hoped and some that were difficult to locate based on what had previously been published. This new book summarises all that I found out, based on my hours of research as well as my experiences in Andalucia in the winter and spring of 2008/09. I’ve done all that work so you don’t have to!